Great Missenden Lawn Tennis Club - An Aerial Tour! Tennis Sessions Every Day Of The Week! First use of grass courts in 2018! GMLTC had two award winners at the Bucks Tennis AGM on Monday 26th November. 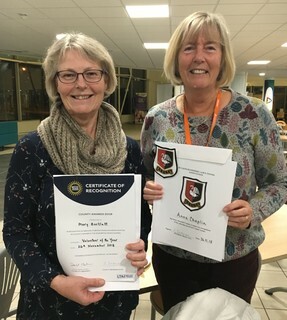 Anne Chaplin received her County Colours for playing in the Ladies Vets Team for many years and Mary Barteltt was awarded Volunteer Of The Year for Bucks in the British Tennis Awards. Mary's award nomination can be read here: Mary Bartlett, Bucks Tennis Volunteer Of The Year 2018. Congratulations to both Anne and Mary for sterling service to the club over many years and to Bucks Tennis! Contact us today if you are interested in joining one of the few 'Grand Slam' tennis clubs in the UK. © 2016 - 2019 Great Missenden Lawn Tennis Club. All rights reserved. Buckinghamshire's Grand Slam Tennis Club promotes safe and inclusive tennis for all. Details of our safe-guarding and inclusive policies can be viewed at this page: Safe & Inclusive Tennis At GMLTC.